Ashalim: In sunny Israel, solar energy supplies only a small percentage of the nation’s power needs, leaving it far behind countries with cloudier and colder climates. 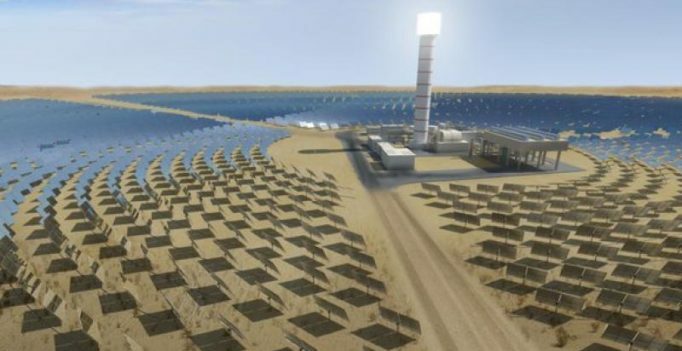 Now the fledgling solar industry is trying to make a leap forward with a large-scale project boasting the world’s tallest solar tower, as a symbol of Israel’s renewal energy ambitions. With Israel traditionally running its economy on fossil fuels, renewable energy has long been hobbled by bureaucracy and a lack of incentives. But the country is starting to make an effort, setting a goal of generating 10% of its energy from renewable sources by 2020, up from the current 2.5%. The Ashalim project, deep in the Negev desert, is made up of three plots, with a fourth planned for the future, each with a different solar technology. Together, the fields will be Israel’s largest renewable energy project when completed by 2018. They are set to generate some 310 megawatts of power, about 1.6% of the country’s energy needs enough for about 130,000 households, or roughly 5% of Israel’s population, according to Israel’s Electricity Authority. “It’s the most significant single building block in Israel’s commitment to CO2 reduction and renewable energy,” said Eran Gartner, chief executive of Megalim Solar Power Ltd., which is building one part of the project. The centerpiece is a solar tower that will be the world’s tallest at 250 meters. Solar towers use a method differing from the more common photovoltaic solar panels, which convert sunlight directly into electricity. Instead, towers use a solar-thermal method: Thousands of mirrors focus the sun’s rays onto the tower, heating a boiler that creates steam to spin a turbine and generate electricity. Encircling the Ashalim tower are 50,000 mirrors, known as heliostats, in a shimmering blanket of glass over the desert. The tower is so tall because the panels were squeezed together to maximize use of the land and the closer the panels are the taller the tower must be, Gartner explained. Another solar-thermal plot at Ashalim will be able to store energy even when the sun goes down. A third plot will use photovoltaic solar technology to produce energy.